Near-death Experiences: Evidence of What? One of the most interesting occurrences that are used to prove that we exist after death are near-death experiences (NDEs). If some aspect of a person survives at death, then the afterlife must be real. For anyone who has read my writings, it is obvious that I believe in what the Bible actually depicts as life after death—the new heavens and new earth. Of course, NDEs are also used to prove something else: that we are all souls that temporarily live in bodies. It is believed that what survives death during these events is really our immaterial souls, which have been “liberated” from these earthly tombs. “Take the case of Howard Storm, for example. Storm, a former atheist professor turned Christian, received a lot of notoriety for his account of traveling to hell during an alleged NDE. In his book, My Descent into Death, Storm describes a horrific place of torment where some type of entities attacked and mutilated him . . . Another well-known example of a near-death experience is Colton Burpo’s account of seeing his deceased grandfather—whom he would later identify in a family photograph—during an emergency surgery. It’s worth noting that a very similar story, which is documented in the book, The Boy Who Went to Heaven, was officially denounced as a hoax in January of 2015. Furthermore, NDERF (the Near Death Experience Research Foundation) has documented thousands of NDEs from across the globe. A short sampling of these otherworldly experiences yields no shortage of variation. In one account, we read about a woman who turned into a “golden orb,” and later proceeded to converse (in Orbese, I suppose) with other orbs before returning to her body. Another account described a man who flew around his city with an unknown companion before coming back to his body. Yet another story described a woman’s heavenly “playtime,” in which she jumped around on the clouds like a child before coming back to earth. Thousands of others could be mentioned, but the point should be clear enough. While there seems to be at least a degree of continuity within some NDEs (like visions of tunnels, lights, deceased relatives, etc. ), the problem is that such accounts are far too disparate to be taken as concrete evidence in favor of the TDP. One person reports having gone to heaven, another to hell, another to infinite darkness, another to a place resembling a hospital waiting room, and so on. Within these different locations, the type of existence recounted by the revived individual also drastically varies. Some claimed to have a body, others only a soul, and still others report all sorts of things in between (recall the glowing orbs). Furthermore, some report to have seen Mohammed, while others saw Jesus, while still others saw the gods or goddesses of pagan religions, and all manner of other prophets and deities. While it would be rash to dismiss every person who claims to have had such an experience, it is also clear that not all of these realities can be valid at once” (pp. 41-42). If you read my blog entitled “Afterlife Confusion,” you would recall the particular case I made there. I said that those who think the Bible tells us about an immediate afterlife (as a soul) are willing to throw competing examples together to prove it. Some go to heaven, some to hell, others go to Hades, and some venture to Abraham’s bosom or paradise; all are apparently supposed to prove that we will live as disembodied beings after we die. Of course, they actually don’t prove that at all. Instead, the “evidence” fights against itself, pointing towards no exact view of life after death. This is an enormous problem for NDEs as well. How can seeing Jesus or Mohammed, going to a waiting room or hell, living as an orb or as a soul, and all of these variations, prove any particular view of the human soul or the afterlife? Should a Christian expect to encounter Mohammed, or to become an orb after death? Put another way: can all of the doors really lead to the same room? I am not trying to say that strange things do not sometimes occur at death, or that there are no documented cases where people were revived with knowledge of things they should not have known. Like UFO sightings or the many known attestations to miracles, some are undoubtedly true and some are undoubtedly not. For my part, I believe the valid examples of NDEs are much better explained as visions. These can be seen in biblical events like John’s “in the spirit” moments of Revelation (1:10, 4:2), and in Paul’s heavenly experience in 2 Corinthians 12:2-4. God has caused the person to see or to know things they would not have known, rather than pulling an immaterial soul out to some literal location. Many people hinge quite a lot on near-death experiences, and I have read many books seeking to prove their validity. Like many other things, there is a place for these events. But I would caution any of us on using them too fervently, and without the proper grain of salt. After all, they seem to prove about every concept of the afterlife out there, not just a biblical one. Throwing them all together gives as much credence to Islam or paganism as it does to Christianity. Is that the type of evidence we want to give to others? Thank you for reading! If you found this blog interesting, please see all the other posts on this site. You can purchase The Death Myth by clicking here. Rossiter, Brian. The Death Myth: Uncovering What the Bible Really Says about the Afterlife. pg. 136. iUniverse. Bloomington, IN. Copyright, 2018. Print. 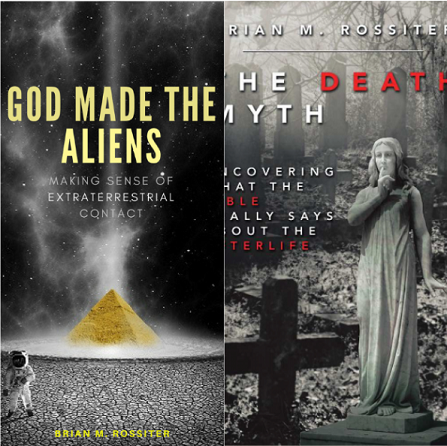 Author Brian M. RossiterPosted on July 13, 2018 November 30, 2018 Leave a comment on Near-death Experiences: Evidence of What? In the previous blog, I broached a very difficult subject. This is true in two major ways. First, severe brain injuries and disorders are horrible realities for both the people who have them and those who love them. Second, these issues show a glaring problem with the typical Christian view that we will go on to live as disembodied spirits or souls when we die. That entire idea was built upon the Greek (and sometimes, pagan) view that people are really spirits with a bodily covering. “You” are an immaterial spirit or soul that happens to live in a body during this life. When you talk to someone, you are not really talking to the thing you see in front of you. Instead, you are talking to the being that lives inside that body. The “ghost in the machine,” if you will. This body keeps us (the soul) trapped inside of it until the day we die. In some sense, the body is a temporary and restrictive tomb for the soul. But as I said at the end of my writing, “If someone gets hit hard enough in the head, their soul changes. Why should that be possible?” If I am actually the soul living in my body, why would a physical injury change who I am? The same would apply to any type of disease that can affect the brain in powerful ways. On that note, it’s interesting to wonder why the body can die in the first place, since the soul within it is alleged to actually be the “living you.” The notion that you are an immaterial being that is presently getting packed around in an outer shell (the body) makes less and less since the more you think about it. It really does. Let’s look at this practically. When we communicate with people, we don’t think we are talking to the soul inside that person; we believe we are literally speaking to that physical person before us. Right? But what if there is no separate “being” inside of that body? What if the soul is not like that at all? What if the soul is like everything else we understand in our world? What if the soul is more like a type of information? Not a little you. Not an immaterial version of you. Not some person that is trapped within the body, or any of the sort. The soul is the information of your life. Consider this: information drives everything in existence. Your computer, Kindle, smartphone, you name it, are all powered by information or data. This is why I repeatedly say that the body and the soul work very much like the hardware and the software of a computer. Both are necessary pieces, and neither can function without the other. In other words, all of your genetics is written in a type of code (hence the term, “genetic code”). Everything that is expressed in your physical body—from the color hair or eyes you have, to the types of diseases you are predisposed to—is determined by an informational code. If you don’t believe me, go send your DNA to 23andMe. You cannot imagine just how many things are determined by your genetic code (information)! “As we are all aware, we cannot hold information with our hands; information is simply not a tangible reality. Yet, it powers our world and indeed the universe around us. It runs our computers, powers our digital devices, explains our languages, codes for our DNA, and so much more” (pg. 127). You may see where I am going with this. The soul is actually information. As I call it, it is “identity information.” The soul is our characters, our personalities; it is what makes us “us.” This changes over time, as our lives progress and we accumulate information. Clearly, our personalities change as time goes on. In some sense, the soul is the data of our lives. This data begins to develop at conception (I believe) and ceases to develop at death. You are the sum of your life’s experiences! The informational code written in our genetics primarily determines our physical existence, and the informational code we call the soul primarily determines our identities. But clearly, the two work and function together. As strange as this may sound at first, it is consistent with everything else in reality. Perhaps more importantly, this gets us out of that nasty little problem I spoke about in the last blog. Traumatic brain injuries and the various forms of dementia change us because these issues alter both our physical and spiritual information. Our life’s data has changed, not some immaterial being within the body. Again, that type of “soul” should remain unchanged by physical damage! When the physical brain is disturbed, it naturally changes the immaterial information associated with it. When the body changes, “we” change. That is why a perfectly normal adult can become a perpetual child after a major car accident, and why a brain disease can turn someone into a completely different person in an instant. All of this information (the soul) will return to God at death, when the breath of life leaves us. At the resurrection, when God provides our perfected bodies, He will reunite the soul with a body that is fit to live for the rest of eternity. Between death and the resurrection, there is no life. There is no immaterial being that goes on to live by itself. There is no living “you” inside the body. But there is plenty of identity information. Alzheimer’s disease and other forms of dementia are truly ugly realities. They can strip people of their relationships, their dignity, and even their identities. There are few things worse than having to watch a loved one deteriorate, ultimately forgetting who you even are. Many of us know the physical effects of these types of diseases, but have you considered the relevance this has on the afterlife? Strange as it is, debilitating brain issues actually pose quite a problem to some of the most popular beliefs about the hereafter. I recall a childhood friend I once had, and the horrific car accident his mother endured during his youth. My friend’s mother went from being an attractive, intelligent, charismatic person, to being a perpetual child in an instant. She lost her adult thinking capacities, and even her physical appearance drastically changed after the traumatic brain injury she received. First and foremost, this was truly tragic. Chances are, many of you reading this have seen something of the sort in your lifetimes. I don’t know about you, but that fact doesn’t make much sense to me. The most popular Christian (and others) belief about human existence is that we each have a soul that lives in union with a body. “We” are immaterial souls, and we live in physical bodies. If that is true, why would a physical injury alter the immaterial soul? Why does a car wreck or a brain disease/injury completely change our personalities? Shouldn’t the soul be, well, immune to physical damage? You would surely think so. But on the popular view, it is not. This is not the only problem, either. This brings up a major question about who we are in the afterlife as well. To further explain the problem, I have included a brief selection from The Death Myth. “What, or who, exactly is it that is supposed to be going to heaven? It can’t be the body; our bodies will end up in either crematoriums or caskets. If it is not the earthly body that goes on, then it must be the soul. While this may seem like a simple observation, it opens the door to some of the most difficult questions we could ever imagine. When a person has lived well into adulthood before passing away, his or her identity has been extensively developed prior to their departure from this world. But what if someone dies, Lord forbid, prematurely? The person—body, soul, identity, and all—someone is as a child is drastically different than the person they are as an adult. You may already see the problem here. Who “we” are depends stringently upon how long we have lived and what has occurred during that time. I was different at five years old than I later was at ten years old, and different at seventeen than at thirty, and so forth. So were you. So is everyone. The unavoidable question, then, is this: what version of “us” goes on into the afterlife? Are some eternally destined to be perpetual, immature six-year-olds? Will those who tragically die before reaching adulthood remain as children forever? Will those who succumb late in their lives to devastating mental illnesses like Alzheimer’s disease or the various types of dementia carry that version of themselves into the next age? In short, there are two major problems if we believe that the soul is the immaterial “us” that lives in a body. You know, the thing that will supposedly go live by itself after we die. The first is that physical circumstances can radically change the soul. If someone gets hit hard enough in the head, their soul changes. Why should that be possible? The second problem is that the person you are at the end of your life would also be the person that goes on to the afterlife. If I pass away with Alzheimer’s, and I am my soul, then I would carry that status after death. At the least, I would live like that during the “interim period”—the time between death and the resurrection. To me, none of this adds up. The view most of us have been taught—that we are really souls who temporarily reside in bodies—just doesn’t seem to work. Is there any possible answer to this dilemma? I believe there is. But that will have to wait until next time. Did you know that, before anyone was called a “Christian,” they were simply called those of “the way”? The way, of course, was supposed to be the way of Jesus. It was also supposed the be the way of truth. Above almost anything else, Christians are supposed to be truth-seekers. We are asked to follow the truth wherever it leads, even if that sometimes puts us in uncomfortable territory. It was that recent realization that brings us to the topic of this blog. One of the biggest reasons why I believe that many of us are wrong about the afterlife is that the we often contradict ourselves on this issue. Notice I said we, and not the Bible. The fact is, everyone who thinks that we possess (or are) a soul that will go live by itself after death has to deal with a major problem—the Bible offers several different ways this might happen: several different places, and several different types of existence. The first is thought to be a place for the blessed deceased. The Bible talks about heaven, “paradise,” and “Abraham’s bosom” as being locations for fallen believers. Wait, that’s three different descriptions! Which is it? Many people have made the case that these are just synonyms for one another: that these are all the same location. In The Death Myth, I discuss all three in great detail, and explain why that is not the case. However, I don’t need to do that in this blog. The fact that there are three possibilities is all I need to say for now. What about the unsaved, the non-believers, or what have you? Well, the Bible speaks of two different realities for these people as well: Hades/Sheol and hell. If you are wondering, the answer is no. Hades/Sheol and hell are not the same thing: not by a longshot. Sheol is the Old Testament description of “the grave,” and is simply the abode of the dead. It was not thought to be some realm for conscious souls. Hades is a Greek concept (and a Greek god), and it is essentially the New Testament version of Sheol. Hades is the abode of the dead and, outside of Greek thought, it was not believed to be a place for conscious souls, either. The term Gehenna was derived from a valley to the south of Jerusalem, where idolatrous Jews had sacrificed their own children to the false god, Molech. After that time, it was thought to be cursed, and became a continuously-burning garbage dump. Nice place! OK, so what is the point? My point is very simple: if we are to believe that deceased people go on and live as disembodied spirits, we must also accept that the Bible would be sending us mixed messages. Maybe you go to heaven. Maybe you go to hell. Maybe you go to Sheol/Hades. Maybe you go to Abraham’s bosom or paradise. The deceased cannot go to all of these places at once, because they are different places! This reminds me of the scarecrow on The Wizard of Oz. When Dorothy is trying to figure out which road to travel, he points out several paths that she might take. Finally, he simply crosses his arms and points in opposite directions. This is what the Bible would be doing, if we believe in disembodied existence after death. We would have an incoherent view on our hands. Many people unknowingly do already. So, what is the alternative? The other path we can take is to understand that none of these destinations are intended to be locations where we will go after we die. The Bible is not telling us about a literal labyrinth for dead spirits (as many Greek viewed Hades to be), or that we will go to either heaven or hell immediately after death. It is true that the Bible often uses imagery and parabolic language to teach moral lessons about the afterlife, perhaps most notably in the parable of the Rich Man and Lazarus. However, parabolic language is not meant to be taken at face value. It does not show us what literally happens at death. In closing, the Bible is also clear that there really will be an afterlife for both the saved and the unsaved. The unsaved will end up in Gehenna, that dreadful place previously discussed, with Satan and the demons. The repentant will end up in God’s newly created world, the new heavens and new earth. But both of these things will happen after Christ returns, and both will be places where we live in bodily form. In the meantime, we “sleep.” We are unconscious until the resurrection. Daniel 12:2, John 11:11, 1 Thessalonians 4:13-18, and many other biblical passages, make this clear. After we take our last breaths on this earth, we will take our first breaths on the new one. But there will be no time spent in some interim world. If we are willing to follow the evidence wherever it leads, we will keep from twisting the biblical message into knots. At the same time, we will also have a much clearer view of reality. It’s one of the central purposes of the Christian faith. It’s the end-game of the whole enterprise, so to speak. One day, after we die, we will make it to those beautiful “pearly gates.” One day, we will make it to heaven. Without question, going to heaven is a worthy goal to have. Or, it would be a worthy goal . . . if it were actually what we should be hoping for. But it’s not. Dying and “going to heaven” is not what the Bible depicts as the final horizon for believers. More than that, it’s not even the place we will go between death and the resurrection. It’s not even a “temporary stop,” so to speak. My entire case for that view is laid out very clearly in The Death Myth. So, if heaven is not the goal, what exactly is? I mean, didn’t Jesus come (in part) to provide a way that we could live with him for the rest of eternity? Yes. Unequivocally, YES. But he had in mind something different than many of us do. While a lot of churches are preaching about living in heaven as some type of disembodied spirit, the Scriptures have always told another story. “There will be no more night. They will not need the light of a lamp or the light of the sun, for the Lord God will give them light. And they will reign for ever and ever” (Rev. 22:5). There is even more to this. Despite the obsession with living as immaterial souls or spirits when we die—which is an idea that comes much more from ancient Greek philosophy than from biblical testimony, I have to add—the Bible is crystal clear that the afterlife is a tangible thing. “Earthly people are like the earthly man (Adam) , and heavenly people are like the heavenly man (Jesus). Just as we are now like the earthly man, we will someday be like the heavenly man. We are never getting rid of bodily existence. Instead, God will replace our fallen bodies with incorruptible ones. And we will go on to live in heaven at that point, right? Nope. Once again, we will not. The book of Revelation explains the type of place we will inhabit—the new heavens and new earth. A new creation: a new heaven, and a new earth. There, we will live with God and His angels, apart from sin, death and suffering. And we will do it with, guess what, new bodies. My hunch is, so will the angels and even Jesus himself (because they already do). I don’t want to die and go to heaven—I would rather have what God has promised us. While I disagree on just a few things, this is a really clear example of why I believe what I do concerning the nature of death and the afterlife. Click here for a quick and highly informative video. In part one of this topic, I talked about us—the living—and how we view the deceased. I ask you to consider whether or not the belief that the dead are now watching over us is a good thing, or a bad thing. In general, I think that question could be answered in two different ways. For some, the thought that deceased loved ones are watching over them is extraordinarily comforting. For others, this prospect brings with it an overwhelming feeling of dread and paranoia. As I said, not all people are good, and not all people are worth remembering. But let’s consider the other side of the coin. Would it really be a good thing for those who have passed away to “watch over us?” They have supposedly moved on to a place of perpetual bliss, but you have to ask the question: what sort of life would that be like? Is that really a heavenly existence? I feel that most of us who talk about how the “dead are watching over us from heaven” have not thought this through very far. No offense intended by that statement. None at all. But I’m not sure that is what any of us should even want. If you fall in the camp that finds comfort in the belief that a lost love one is watching over you, consider how that loved one might see things. Do you want your mom, dad, brother, sister, spouse, friend, or—Lord forbid—your child, seeing what happens in your life after they are gone? Think hard about that question. It’s all well and good to think that they might be celebrating with us at, say, our college graduation, our wedding, or at the news of a big job promotion. But we also know what that sort of ability (the ability to see our lives) would also bring with it. Every time we fall short; every time we fail; every time we lash out in violence or anger; every time we suffer; every time we make others suffer; every time that tragedy strikes; and every time that one passes away . . . they would be watching. Would your mom or dad want to watch you die? That question ought to be rhetorical. No: who would want that? Besides these issues, there is one really huge problem with this belief. Wouldn’t the ability to see everything we are doing essentially equate to having God-like knowledge and understanding? Isn’t it God—and God alone—who is supposed to be able to peer into every person’s life, and track his or her every move? It troubles me that most of us are so eager to grant those abilities to deceased human beings. It should bother those of us who do it. Clearly, God can handle this ability—but even He mourns our losses; “Costly in the sight of the Lord is the death of His saints” (Ps. 116:15). We of course know that Jesus wept (inconsolably) at the death of his friend Lazarus. However, it’s a little crazy to think that deceased human beings can endure seeing all of the death and suffering that occurs in our world. Don’t you think? I am not trying to lay a guilt trip on anyone. That is not my intent in saying any of this. As I noted earlier, I don’t believe most of us have thought this through. But now we can. It is not too late to change the way we think about death, or the way we speak about the deceased. The next time that tragedy strikes, and someone you know leaves this world, think about how you speak of him or her. Whenever we either say or hear, “this person is looking down at us from heaven,” ask yourself what all that would actually entail. Is it really a good thing for them if they are now “watching over us”? Is it really a good thing for us, either? Personally, I answer “no” to both questions.